Tyler, what stands out most in your mind when you think about the years you spent at Beyond the Beat? Did your family think they had a rock star on their hands? It created some of the fondest memories of all time for me and especially for my family. To this day, my father still talks about that first performance at the Marquee Theatre in 2006. Me and other students had amazing fun and gained experience in a live show, but my dad, he lists it as one of his greatest memories ever…and that’s priceless. How long were you a student? Ever since Grade 4 and all the way up to Grade 11. I was blessed to learn music from someone I believe to be the best music teacher in Toronto. When I started looking for lessons, I had bounced from studio to studio looking for the right music teacher; it wasn’t until I met Dave that I felt comfortable. I was nine. Nine? How did you know it was that special? After the very first lesson, I remember being immediately drawn to Dave because the way he taught was so unlike all of the other schools I had gone to. What I love about Dave is that he understands his clientele very well. He and his teachers focus more on the students: what music they like to play and what makes them come back for their next lesson, which is having fun and finding joy in music (which is the entire point, isn’t it?). Dave begins by having students, who are mostly kids, find joy in playing the instrument before overloading on theory, which some could see as boring. That’s exactly why I stuck with him for the rest of my guitar-playing career and how I learned to play Wild Thing along with dozens of other songs I performed. So you’d recommend potential students drop by the studio? Absolutely. 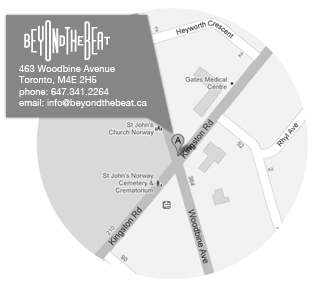 Beyond the Beat has played a huge role in my development as a musician, but more importantly as a person. I have met some of my closest friends through the Beyond the Beat community. I owe a lot to it for playing such a huge role in my life.